For those who love this great little bike. 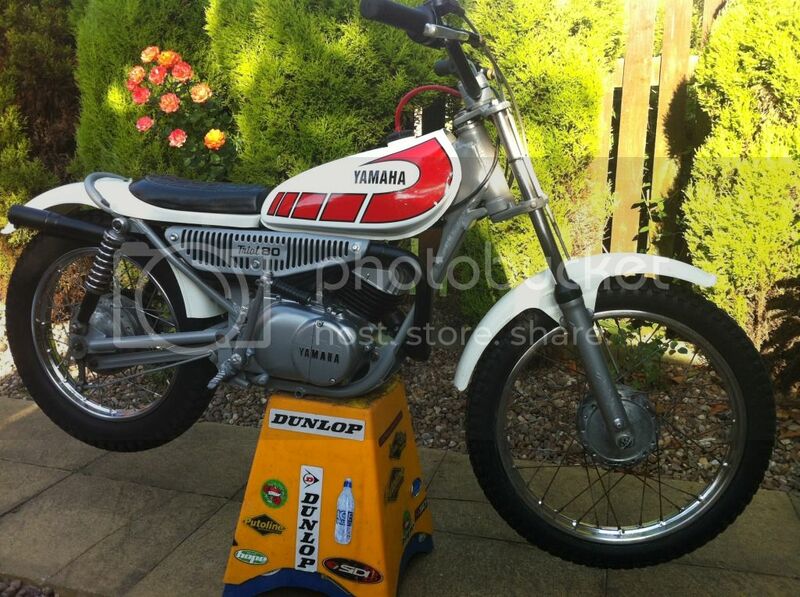 I had a ty80 as a child and have always loved this great little bike. I run this website and restore ty80's as a Hobby. The price charged for any bikes is to cover the cost of restoration. I would just like you to enjoy the ty80 like i do. Thanks. I do have some spare parts, contact me with your needs. The Yamaha TY80 is a trials styled motorcycle produced by Yamaha Motor Company from 1974-1989. When new it was capable of around 40 mph. It was part of a range that included the TY50P, TY50M, TY125, TY175 and TY250. Interestingly it uses a gear configuration of neutral in the lowest position, and then the ascending gears going upwards from there; as opposed to most modern motorcycles which feature 1st gear in the lowest position, neutral up 1 half-click and then the ascending gears going upwards. Designed by Mick Andrews and Mick Whitlock (Whitehawk 1979) in 1974, and ran pretty much unchanged through to 1989. This was the Junior trial machine of choice at this time, being first and foremost excellent value, extremely competent, and with a user friendly torque spread from the masters of the two stroke art! Terms and conditions. All orders require a £250 deposit. Bikes must be paid for in full and collected within 2 weeks of notification they are ready for collection or your deposit is void (and any other monies paid) and the bike will be re-advertised. Prices for Ty80's (due to increase in prices on second hand bikes and becoming harder to find good bikes i have had to increase prices to) £1250. Whitehawk Ty80's (when available £1495-£1995). Yamaha Ty80 sent to California. Yamaha pw80 for sale vgc £650. Very rare mk1 with mk11 upgrades Whitehawk for sale fully restored £1295. There was less then 100 of these produced so very rare Ty80 Whitehawk. Wheels and hubs powder coated rebuilt with new spokes. Whitehawk ty80 £995. Reduced price as need room for more projects. You can see the difference in size between Ty80 and Whitehawk Ty80. Yamaha ty80 finished for delivery to Newcastle. I have a selection of Oset electric trials bikes, ONLY 2 LEFT, if you would like to reserve one please contact me. These are ideal for those budding trials riders who are too young or too small for a Ty80 at the moment. , comes with stabilizers if needed. Call for more info. Yamaha ty80 below ready for lucky lad for Christmas. Fully restored. Yamaha ty80's below all sold but more availble, please contact. Yamaha ty80 mono shock special. Many young trials riders (including the top riders in Britain today) went on to become international trials stars having this superb little machine from Yamaha to thank, both for its reliability and easy handling characteristics. It is still the choice of a lot of young riders to this day. Today these super little bikes are becoming harder to find in good condition or even restoration projects and parts are becoming very expensive with some parts obsolite. Here at www.yamahaty80.co.uk we locate bikes and spare parts then completely restore the bikes with NO expense spared. Whitehawk ty's are even harder to locate these days. Whitehawks were made as MK1,MK11 and MK111. Ian Pebery keeps the Whitehawk name alive today with some original parts still available and Ian also makes some parts himself. Nice little video below of ty80.